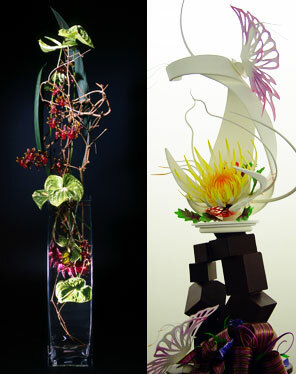 A floral creation, left, by Hitomi Gilliam inspires work in sugar and chocolate, right, by pastry chef Stanton Ho. Floral artistry and chocolate wizardry come together in an unusual celebration of food as art Sept. 22 and 23 at Macy's Ala Moana. Master floral designer Hitomi Gilliam of Canada will set the theme with exotic tropical arrangements -- called "Neo Tropica." Gilliam is an internationally known instructor, consultant and author of three books on floral design, one of just five recipients of the American Institute of Floral Designers Design Influence Award and the 2006 recipient of the American Horticultural Society's Frances Jones Poetker Award for significant contributions to the appreciation of creative floral design. In June in Vancouver, she interpreted Claude Monet's famed garden at Giverny for a benefit hosted by Chanel and the Vancouver Art Gallery. She will host two demonstrations on the 22nd, at Macy's special-events room on the third floor. The first, at 10 a.m., is for the general public, with admission of $5. The second, at 1 p.m., is for advanced designers; cost is $100. Call 959-3535. Ho and Gin Caldwell assembled an elaborate chocolate piece last month. It's been stored at the Pineapple Room for display at next week's "A Feast of the Senses." 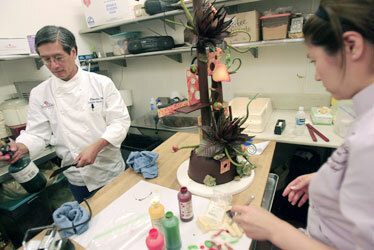 The next day, Gilliam's creations will be moved to the Pineapple Room restaurant at Macy's for "A Feast of the Senses," celebrating the restaurant's eighth anniversary. Chef Alan Wong and his crew will serve special dishes from food stations around the dining room, but the party's emphasis will be on creating a complete sensory experience on the floral theme. Chocolate and sugar sculptures created by guest pastry chefs Stanton Ho of the Las Vegas Hilton and Gin Caldwell of Ethel M Chocolates in Las Vegas will echo Gilliam's artistry. Cost for the 5:30-8:30 p.m. dinner is $125. Call 945-6573. Proceeds from both the floral class and the dinner will benefit Ma'o Farm, an organic farm in Waianae that helps high school students develop entrepreneurial skills and prepare for college.